Musical Ecologies continues Thursday December 8th with Brooklyn-based Multi-instrumentalist Mark Stewart. Though best known as a guitarist, Stewart is also widely regarded as a prolific inventor of handmade musical instruments. For over two decades he has maintained an instrument workshop and sonic salon known as the “lab” creating a dizzying array of invented instruments out of collected garbage, PVC pipes found on street corners, and latent objects of every sort charged with unexplored musical potential. 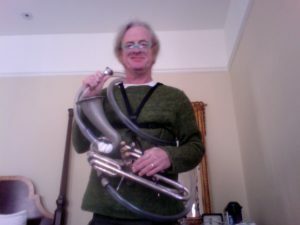 The evening will focus on these unique creations through a “new music hootenanny” wherein Stewart will introduce and demonstrate many of his instruments and lead the audience in a spontaneous participatory performance. The evening will begin with a conversation hosted by series curator Dan Joseph, and a reception will follow. Multi-instrumentalist, singer, composer and instrument designer Mark Stewart has been heard around the world performing old and new music. Since 1998 he has recorded, toured and been Musical Director with Paul Simon. A founding member of the Bang on a Can All-Stars, the comic duo Polygraph Lounge with keyboard & theremin wizard Rob Schwimmer, Mark has also worked with Steve Reich, Sting, Anthony Braxton, Bob Dylan, Charles Wourinen, Cecil Taylor, Meredith Monk, Stevie Wonder, Phillip Glass, Hugh Masakela, Iva Bittova, Bruce Springsteen, Ornette Coleman, Edie Brickell, Don Byron, Joan Baez, Paul McCartney, Jimmy Cliff, the Everly Brothers, Fred Frith, Alison Krauss, David Krakauer, Bobby McFerrin, David Byrne, James Taylor, The Roches, Aaron Neville and Marc Ribot. He has worked extensively with composer Elliot Goldenthal on music for the films Midsummer Night's Dream, The Tempest, Across the Universe, Titus, The Butcher Boy, The Good Thief, In Dreams and Heat, often playing instruments of his own design and construction. He has designed instruments for TFANA's productions of Midsummer Nights Dream & King Lear and is the inventor of the WhirlyCopter, a bicycle-powered Pythagorean choir of singing tubes and the Big Boing, a 24 ft. sonic banquet table Mbira that seats 30 children playing 490 found objects. He is on the faculty of the Manhattan School of Music & a Visiting Lecturer at MIT. Stewart can be heard on Warner Bros., Sony, Sony Classical, Point/Polygram, Nonesuch, Label Bleu, Resonance Magnetique, Cantaloupe and CRI recordings. He lives in New York City making his living playing and writing popular music, semi-popular music and unpopular music. Comments closed — Trackbacks closed RSS 2.0 feed for these comments This entry (permalink) was posted on Tuesday, November 15, 2016, at 2:38 pm by Dan Joseph. Filed in press release.